Hang up those walking boots! The days of making that long trek to the Land of Oz and talking with that unwieldy Wizard to find the answer to all of your decorative concrete and paving needs are over; that yellow brick road just got a little bit shorter. Whether you are in the market for flooring, paving, decking, countertops, or other applications, Bomanite offers unrivaled beauty, versatility and sustainability to meet all of your design needs. Innovative systems in the hands of highly creative, skilled franchise partners translate into extraordinary architectural concrete paving and flooring solutions available around the world. That's Bomanite. That's truly a horse of a different color. When the design team for the Legends at Village West project, located in Kansas City, KS, were looking to add some panache to the landscape of the brand new retail and entertainment center, they knew right away what to do. No, they didnt gaze up at the sky, make a wish and break out in song about rainbows and lemon drops in hopes that all of their decorative concrete dreams would come true. They called on Bomanite Franchise Partner, Musselman & Hall Contractors, L.L.C., in Kansas City, MO, for the job. 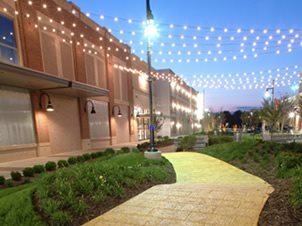 Accenting the lush landscape beds winding through the pedestrian plazas and patios, Musselman & Hall created the golden, now dubbed Yellow Brick Road, central strolling lane to add texture to the overall tapestry of the charming courtyard design. The prominent Bomacron pathway, only one of the several decorative concrete areas completed by Musselman & Hall for the Legends project, was done with a yellow liquid pigment, white cement and 12x24 Running Bond Granite pattern, connecting the seven pedestrian plazas, courtyards and corridors. Out of the total 750,000 sq. ft. location, over 198,000 sq. 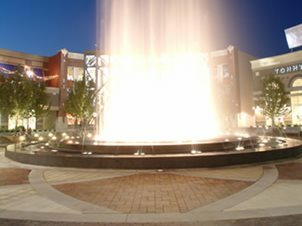 ft. of decorative concrete was installed by Musselman & Hall with 175,000 sq. ft. being plain gray concrete, 19,600 sq. ft. imprinted and 3,500 sq. ft. stained. Located in Kansas City, MO, Musselman & Hall offer a complete selection of architectural concrete options anchored on the exclusive franchise of Bomanite quality products and services. With the durability to stand up to the toughest traffic loads and environmental conditions, partnered with the obvious aesthetic appeal, utilizing Bomacron was a perfect choice to add distinction and style to the large-scale hardscape project. 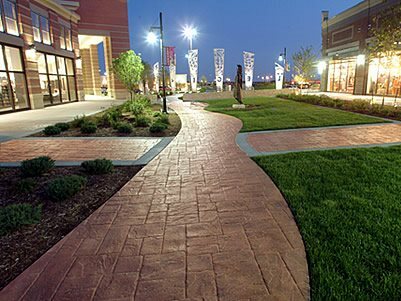 Bomacron, one of Bomanites staple Imprint Systems, is used in a variety of residential, commercial and municipal applications where the designer wants to upgrade plain concrete or asphalt, or alternatively, wants to reduce the cost of installing natural paving materials such as slate or granite. An exciting, quality hardscape with resilience and beauty to be admired by passers by is exactly what the Legends design team was looking for; and its exactly what they got. With help from the skilled craftsmen at Musselman & Hall, the vibrant entertainment destination brightens up the entire West Village area of Kansas City, KS, and has people saying, Toto. I dont think were in Kansas anymore. For more information on Bomanite Imprint Systems or any other product featured here, just click your heels together three times and say, theres no place like Bomanite, theres no place like Bomanite, theres no place like Bomanite. All kidding aside, just click here or visit www.bomanite.com.